Werkraum Bregenzerwald is an internationally renowned centre of competence for innovative Austrian craftsmanship in Vorarlberg. In July, the association moved to its new home in Andelsbuch: the Werkraum House designed by star architect Peter Zumthor. For this sophisticated architectural project, Zumtobel, the Austrian provider of lighting solutions, has implemented a customised lighting concept that meets the highest demands in terms of design and functionality and offers visitors a unique exhibition experience. The Werkraum Bregenzerwald association of crafts and trade has found a new home in the Werkraum House in Andelsbuch. The visionary building designed by renowned Swiss architect Peter Zumthor features a large wooden roof and a façade made of glass that makes the landscape seem to pass through. Hence, the Werkraum House serves as a kind of showcase for promoting the work of Bregenzerwald craftspeople. Eighty local master workshops joined forces to form the Werkraum association. 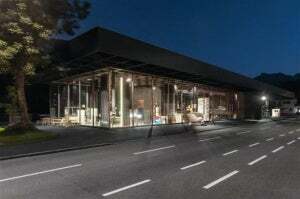 The Werkraum House serves as a hub and meeting point for building developers and architects and also accommodates exhibitions, events, a shop and a café. The unique architecture of the multifunctional building placed special requirements on the lighting system. During the design stage, highest priority was therefore given to a flexible lighting solution to enhance the building’s architecture and ensure high lighting quality. In addition, the lighting scenario creates a pleasant atmosphere for visitors and staff. The Austrian lighting expert Zumtobel was called in because both the client and the architect needed a top-class partner with international experience and premium advisory skills. Zumtobel developed a custom-made lighting concept involving a number of special solutions for the various functional areas in the Werkraum House. For the part of the building that is open to the public, where various Werkraum members exhibit their work, Zumtobel used 100% cutting-edge LED technology. The LED option cannot fail to impress thanks to its easy integrability into a lighting management system, so that the lighting can be flexibly controlled whenever events or exhibitions are held. Managing director Renate Breuss said: "Lighting is especially important when it comes to presenting the achievements of our craftspeople in the right light in a targeted manner. On the other hand, it is precisely the light, in combination with acoustics, that sets the stage for a room’s atmospheric qualities. Here at the Werkraum House you can see a sophisticated combination of artificial lighting and daylight." In order to ensure perfect room acoustics, the open hall of the building where events are held was fitted with a thickly cushioned coffered ceiling made from timber. Zumtobel used a specially designed suspension system to install some 160 LED spotlights of the Panos Infinity range in this area. These downlights provide uniform ambient lighting as well as especially good lighting quality and are also highly efficient. Additional accent lighting and excellent colour rendering are ensured by nearly 90 swivelling Vivo LED spotlights, also fitted with a special pendant suspension system, which are used mainly for highlighting individual exhibits. Hence, Vivo provides accent lighting, creates contrasts and puts the focus on the exhibits, ensuring a fascinating art experience for the visitor. In order to allow simple connection of the luminaires to the power supply and lighting control system as well as integration of an emergency lighting system, the Tecton continuous-row lighting system is used. This allows quick adjustment of the lighting solution to changing requirements thanks to no-tool installation. Moreover, Zumtobel has proved its flexibility in implementing individual requirements by providing a custom solution for the staircase and sanitary areas. Special downlights were flush-mounted in the concrete ceiling. They provide ideal lighting conditions to facilitate orientation and guidance and at the same time enhance the room’s architecture. For emergencies, Zumtobel has installed Puresign and Resclite LED luminaires in the building. On the basement level, perfect orientation is ensured by suspended Tecton luminaires fitted with fluorescent lamps and rugged Scuba luminaires providing uniform lighting.